Why Buy a Sports Attack Rugby Machine? 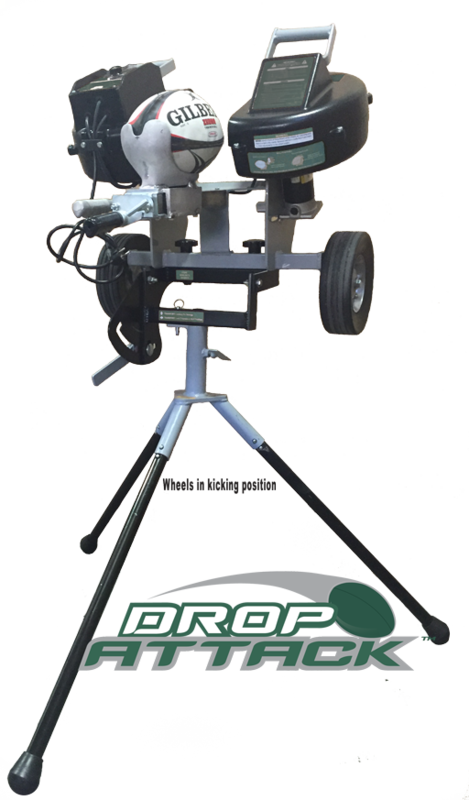 The Drop Attack rugby training machine is a pass and kick machine that will maximize your training time on the most difficult to practice phases of the game. True to its name, this unit will deliver a realistic drop kick, firing the ball 40-50 yards into the air. It will also replicate chandelles (or up and under) and torpedo kicks, hundreds of precise repetitions per practice. With a simple and quick adjustment to the wheel position the Drop Attack instantly becomes a passing machine. Passes to feet as well as powerful torpedo and spin passes can be thrown with extreme consistency. The coach can now work on different combinations that he wants to play with his forwards and defenders. For instance he can start the game with a drop kick and he can get the forwards to work together to win the ball. For lineouts he can work with different set plays and just focus on throwing the ball down the line. Using the machine to deliver all of the kicks and throws allows the coach to focus entirely on training each athlete. This unique training tool has solid polyurethane throwing wheels that firmly grip the ball for a precise ball delivery. The wheel guards protect the wheels and help to keep the wheels as dry as possible in inclement weather. Rapid fire and multiple ball drills are part of the Drop Attack’s repertoire. The two independently running electric motors create not only a near instantaneous recovery time, but furnish enough power to put the rugby ball anywhere on the field. It can pivot instantly in any direction, accurately throwing passes or drop kicks to any location on the field. Ball cradle positions the ball perfectly for either passing or kicks. 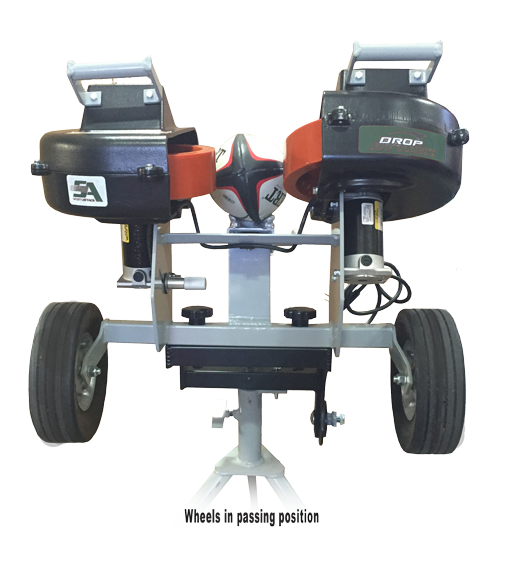 Two high-powered motors provide instant recovery, allowing rapid repetition and combination of drills. Handles safely facilitate tilting of wheel to locate and lock throwing head into desired position. Stand allows throwing head to pivot instantly in any direction, accurately throwing passes and kicks to any location on the field. Elevation changes are quick and easy. Machine can also be locked in for precise repetition. Solid guarded wheels are specially-designed for minimal wear and last the life of the machine with no need for pressure changes. Unit quickly moves on and off field; just tilt it, unsocket legs and easily roll it on two transporting wheels. Controller is accessible, visible and safely away from throwing wheels. Cast aluminum throwing wheel guards protect players, coaches, fingers and hands during operation. No assembly is required. Unit arrives fully assembled and ready for your immediate use. Aluminum casting is light, strong and weather-proof. Steel-plated frame for strength and weather-resistance. Solid polyurethane wheels provide tight spiral, long distance and accuracy and minimize marking and wearing of balls. No air pressure required. Two extra-wide solid transporting wheels make moving machine on and off field easy. Extra-wide tripod base insures real stability and safety. Two powerful variable speed motors drive two indestructible football throwing wheels. Maintenance free! All bearings are sealed and good for life of motor. Weight Without stand 90 lbs., with stand 115 lbs.